After months of planning, growing, preparing (and just a tiny bit of panicking), our first big show was a huge success! The concept of straw bale gardening was something that many people had not seen before, even among the most experienced of gardeners. It was such fun to introduce BaleGrow to so many people. I don’t think I could ever tire of watching people’s faces light up when they saw our beautiful display of lush vegetables, herbs and flowers growing out of straw bales. Straw bale gardening is a centuries-old idea, that BaleGrow delivers in a simple-to-follow system. We’ve done all the research and testing for you, so you can get your garden growing straight away, with a crop yield impressive enough to please any gardener. 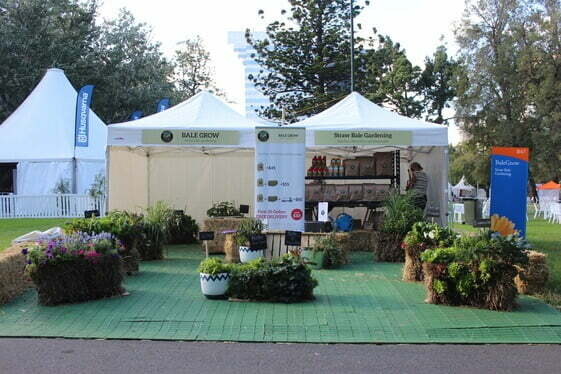 The feedback from visitors to the Melbourne International Flower & Garden Show was overwhelmingly positive and we could not be more grateful for such a wonderful response to our growing business. To those of you who visited us at the show, or have contacted us since, we sincerely thank you for your support. So what’s next for BaleGrow? With distributor interest now in QLD, NSW and SA we will be working hard in the next year to expand our brand to reach as many gardeners as possible. The show has given us the ability to showcase this concept to a broad range of people from all over the country. We even had plenty of interest from our neighbours in New Zealand. The show also gave us the opportunity to network with some really inspiring people within the gardening industry. And wow, the things we have learned from some talented people! The horticultural community welcomed BaleGrow with open arms, which has really energised us for our next phase of growth. There are so many exciting projects in the pipeline for BaleGrow… watch this space!